Ideal tension is the lowest tension at which the bell will not slip under peak load conditions. Check tension frequently during the first two days of operation. Over tensioning shortens belt and bearing life. 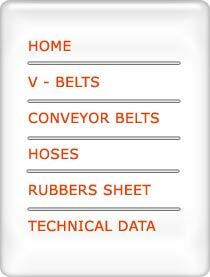 Keep belts free from foreign material which may cause slip. Make V-drive inspection on a periodic basis. Adjust tension when slipping. Never apply belt dressing as this will damage the belt and cause early failure. a. To provide take up for fixed centre drives. c. To turn corners as in mule pulley drive. d. To break up long spans where belt vibrations may be a problem. e. To maintain tension to act as a clutching device. Idlers should be placed as close to the pulley from wheel to belt leaving the pulley. NOTE - Diameter of outside idler should be one and half times that of smaller pulley diameter or more and diameter of inside idler should be approximately same as that of smaller pulley diameter or more. LOWER LIMITING VALUE: nominal centre distance minus 1 5% Lp. HIGHER LIMITING VALUE: nominal centre distance plus 3% Lp. Lp is the pitch length of the belt. Maintaining the proper storage conditions at the users place as well as at the manufacturers place is an important parameter which requires due attention from the concerned. Under favorable storage conditions, Darwin Plus belts retain their initial serviceability and dimensions. Good storage facilities and practices, will allow the users to achieve the best value from belts. Darwin Plus V-belt should be stored in a cool & dry place with no direct sunlight. When stacked on shelves the stacks should be small enough to avoid excess weight on the bottom belts which may cause distortion. When stored in containers the container size & contents should be sufficiently limited to avoid distortion. 1. Do not store the belts on floor unless a suitable container is provided. They may be exposed to moisture. 2. Do not store belts near windows which may permit exposure to sun-light or moisture. Do not store belts near radiators or heater. 3. Do not store belts in the vicinity of transformers & electrical motors. These devices may generate ozone. The common method of storing the v-belts is to hang them in crescent shaped pegs or pin racks. Long V-belt should be coiled for easy distortion free storage. Variable speed belts are more sensitive to distortion, it is recommended that these belts should never be stored on pegs These belts should be always stored on shelves. The shelf life of 5 years can be obtained if proper storage conditions are maintained i.e. ambient temperature not more than 30 ºC and relative humidity not more than 60%. If the storage temperature increases, then the service expectancy from the belts gets reduced. Under rough estimates it can be said that for an increase of 20 ºC temperature above the standard temperature range the belt life will be reduced by 50%. It is always recommended that if a drive is out of use for a prolonged period, then belt tension should be relaxed & the necessary tension be provided when the drive is to be restarted. Under no circumstances the belt should be stored at temperature above 46 ºC. 1. Perfect alignment of pulleys. 2. The grooves must be free from burrs, sharp edges, rust, oil and grease. To prevent this, the drive should have some guard. 3. In multiple drives belts are to be used of same manufacturer. 4. 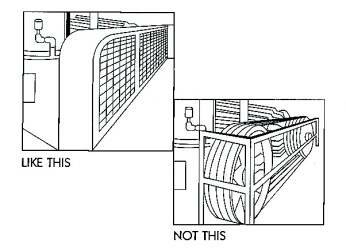 Do not pry or roll V-belts in to the pulley grooves, in such a case, the belt get damaged internally as a result of which belt life is negatively affected. Using drive take-up enable the belts to be easily mounted on the pulleys. 5. For multiple drive, use as many V-belts required for better service life and low maintenance cost. For best results we recommend our customers to use Darwin Plus Match Free v-belts. The whole set should be replaced if one belt fails. Darwin Plus belts should not be lubricated. 6. A change in ride out indicates uneven belt wear or worn sheaves. Change Belt/Sheave with new set. 7. Pulleys should be checked whether it is manufactured as per international standards or not, and should also be checked for worn out of grooves. Bearings should also be checked for lubrication. 8. If the groove angle is too large, the canvas cover is quickly worn out along the lower side walls and if opposite the upper canvas gets worn out. 9. Proper ventilation of the drive is a must. 10. Tensioning of the belt should be checked from time to time. 11. Belt dressing should never be used. 1. BELT TURN OVER IN a) Poor drive alignment Realign. 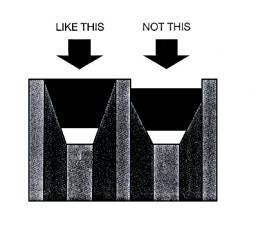 PULLEYS b) Incorrect pulley grove or excessive wear in grooves. Renew or replace pulleys. c) Excessive belt flap. Use an inside idler on slack side. d) Low belt tension. Re-tension. e) Worn out belt Replace with new belt. 2. EXCESSIVE WEAR a) Incorrect pulley section. : Renew or replace pulleys. b) Excessive wear in pulley groove. : Renew or re-machine pulleys. c) Poor drive alignment. : Realign. e) Belt catching or protruding parts. : Remove protrusion or remove drive away. 3. EXCESSIVE NOISE a) Poor drive alignment : Realign. 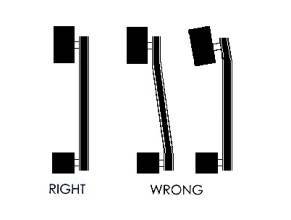 b) Incorrect belt tension. : Re-tension. c) Overloaded drive. : Check drive details & redesign. d) Unbalanced pulleys. : Redesign, if necessary balanced the pulleys. prevented use DARWIN PLUS construction V-Belts. 5. UNUSUAL BELT STRETCH a) Worn out badly damaged grooves. : Re-machine or renew pulleys. b) Used belts with new belts on drive. : Replace with completely new set of belts. c) Belts from different manufacturers. : For use a matched set, belts must be from one manufacturer. 6. BELT BREAKING AFTER a) Forcing belt over pulley when fitting, damaging cord & cover. : Reduce drive centre distance to fit belt. FITMENT b) Ingress of a foreign material. : Fit an effective guard. c) Insufficient belts or wrong section for drive. : check drive design & fit correct no. or section of belts. d) Drive stalled. : Ascertain cause & rectify. 7. CUTS AND SPLITS IN THE a) Outside idler pulley in use. : Replace with inside idler pulley on the slack side of drive. Use DARWIN PLUS notched construction V-belts. d) Ambient temperature too high. (above -18°C) : Warm area surrounding drive. f) Contamination by oil or chemical : Protect drive from contamination. 8. SEVERE BELT VIBRATION a) Drive has insufficient belts. : Check drive design & modify if necessary. b) Centre distance more than recommended. : Shorten centre distance, use an inside idler in the drive slack side. c) High shock loading. : Use banded belts/Use an inside idler pulley in the slack side. d) Too low belt tension. : Re-tension the belt. e) Unbalanced pulleys. : Balance the pulleys. 9. CANNOT BE RE-TENSIONED a) Insufficient allowance for stretch in drive design. : Give sufficient allowance for take up. b) Excessive stretch caused by insufficient belts or wrong belt or : Recalculate drive design & modify. wrong belt section for drive. c) Incorrect belt length. : Use a shorter belt. d) Belt from different manufacturers used on the same drive. : For used as a matched set, belt must be from one manufacturer.